Hi, I am interested in your 1966 Pontiac GTO (stock #0981-NSH) listed on Autotrader for $41,995. I'd like to get more information about this vehicle and confirm its availability. 1966 was a big year for the GTO. The car went from being the Grand Tempest Option package, to being its own unique model, and started writing its own story, just like a child who grows up, moves out of the house and starts writing their own story. That story has become a well-known and significant part of automotive history. Father Pontiac named it the GTO Tiger, but as happens sometimes, it became best known by its nickname, the Goat. Check it out. Along with moving out on its own there was a change of style with more muscular curves to the body giving it the now classic coke bottle look. Up front, a distinctive front end leads the way with a split grill and vertically stacked quad headlights that are trimmed in chrome with a sharp looking bumper underlining them. Silver is a tough color to get right, but as you look over that distinctive hood and down the sides of the car, you will be hard pressed to find any imperfections and would be proud to enter this car in a show. There is correct badging in the grill as well as on the fenders and trunk. Chrome outlines the wheel wells and polished rocker trim connects them front to rear. The back of the car looks great with taillights that feature a rare louvered cover found only on the GTO surrounded by chrome trim on the top and the bumper with dual exhaust tips peeking out the bottom. Open the door and you will find an interior of black and wood with chrome highlights that is in great condition with no cracking. The door panels are vertically pleated with a GTO badge over the armrest and chrome piping along both the top and bottom. The seats look like new with pleated centers and smooth vinyl surrounds. The wood starts with a deep dish, three spoke steering wheel mounted on a tilt column that sits in front of the wooden dash panel. Gauges are across the top with controls along the bottom and everything works. An updated AM/FM/Cassette player is there for your listening pleasure with an Autogauge trio mounted under the dash to help keep track of critical engine functions. A Pontiac vacuum gauge is mounted on the wood tone center console just in front of the shifter for the automatic trans and the carpet and headliner which are also in great shape finish out the quality look of this interior. Pop the hood and you will find a neat and clean engine bay with a nicely dressed out 400 cubic inch engine nestled down into it. There is a chrome Edelbrock air topper with an Edelbrock carburetor and intake manifold underneath it. Black valve covers with Pontiac in brushed lettering look great with the blue paint of the heads and block. There is power steering and power front disc brakes on this car and the belts, hoses, and wiring are all new and neatly routed. If things heat up on a Friday night or at the strip, there is an aluminum radiator to make sure things stay cool. Power flows back through a 3-speed automatic trans and dual Flowmaster mufflers make the car sound great. Steering and brakes have been serviced with parts like the ball joints obviously replaced recently and a stout front sway bar to help out the cornering a bit. The car rides on factory PMD wheels with 225/70R14 mounted all around. 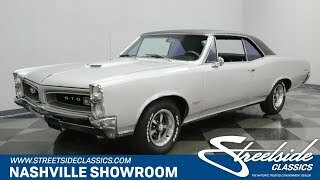 Check out this GTO from the first year it moved out and became its own model. You might decide that it needs to move into your garage.